Outdoor enthusiasts now have better access to more than 150 kilometres of non-motorized trail in West Bragg Creek and Kananaskis Country. 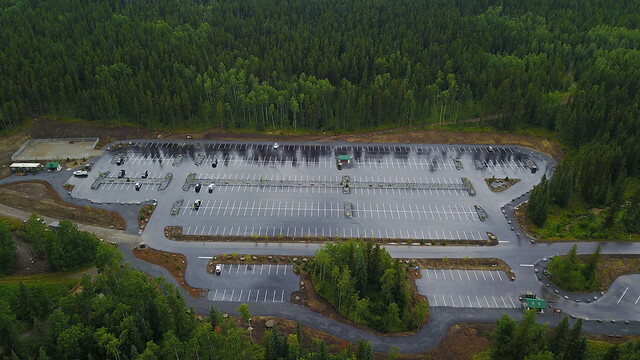 Upgraded parking lot at West Bragg Creek Provincial Recreation Area, part of the government’s investment to improve user experience. In partnership with government, The Greater Bragg Creek Trail Association (GBCTA) completed a 7.5-kilometre trail that connects the Hamlet of Bragg Creek to the West Bragg Creek Provincial Recreation Area. It also extends The Great Trail, formerly known as the Trans Canada Trail, east to Calgary, creating the world’s longest network of recreational trails. Combined with government’s $2.5-million upgrade to the West Bragg Creek Provincial Recreation Area (PRA) and a new West Bragg Creek interpretive trail (Watershed Heritage Trail), efforts have created an amazing nature experience for hikers, mountain bikers, equestrian users, snowshoers and cross-country skiers. The upgrade to West Bragg Creek PRA significantly enhances the user experience by alleviating parking issues and improving emergency access. The popular PRA has seen visitor numbers quadruple over the past eight years. The parking lot has been paved and expanded from 190 parking stalls to 485. Additional enhancements to the PRA include signage and kiosks, benches, designated meeting locations, new washrooms and garbage and recycling receptacles, a perimeter trail for easy access to the surrounding trailheads, a permanent location for the Trail Centre and a designated instruction area for cross-country skiing skills training and small-scale event staging. A unique element for trail users and separate from The Great Trail is the addition of the scenic Watershed Heritage Trail. The trail features a series of information panels highlighting local history and trail building in the area and was funded and sponsored by the Elbow River Watershed Partnership and the GBCTA. The trail provides access to the Bragg Creek Provincial Park, Kananaskis Country, Calgary and a number of protected natural areas. Intended users are walkers, hikers, joggers, cyclists (slow recreational, not higher-speed road bikes), cross-country skiers, snowshoers and horseback riders. Ten subdivisions and many homes are along the trail that now connects to the Hamlet of Bragg Creek, allowing people an alternative to commuting via car. The majority of the trail is flat with minor variations; three road bridges exist and sidewalks have been added to two bridges. An additional pedestrian bridge is scheduled for completion next year. The Great Trail stretches for more than 24,000 kilometres and profiles Canada’s diverse landscapes and communities. The Great Trail touches over 15,000 communities; 80 per cent of Canadians are within 30 minutes of the trail. The Government of Alberta has provided over $8 million towards The Great Trail in the province. The parking lot has been expanded to include 475 public stalls, eight pull-through stalls in a separate equestrian parking area, two designated bus stalls and a designated emergency access lane.